Iran-backed Shiite militias in Iraq are growing more powerful and confident as they operate with increasing impunity. Gunmen murdered Iraqi novelist Alaa Mashzoub, a chronicler of Iraq's lost Jewish community, as he rode his bicycle through his hometown of Karbala Feb. 3. Mashzoub was a bold critic of Iran's increasing power in Iraq. His relatives believe that was what led Shiite militiamen to target him. A few days after the killing, Aws al-Khafaji, a powerful Shiite militia leader in his own right and Mashzoub's kinsman, appeared on TV and denounced Iranian interference in Iraq. He was captured by the Shiite militias of the Iran-backed Popular Mobilization Units and has not been seen since. The same week, in a less dramatic but equally ominous incident, Iraqi Shiite militiamen challenged a U.S. Army foot patrol near the al-Qathia base in eastern Mosul. Heavily armed men parked a vehicle in the way of the patrol and followed the U.S. troops, filming. The video clip released later triumphantly declared, against a background of tinny martial music, that the fighters of the Popular Mobilization Units' Ninawah Command had successfully disrupted the American attempt to conduct a patrol in the city. These events, among others, demonstrate that Iran's Shiite militia allies are beginning to constitute a second power in Iraq, within and beside the official state. Confrontation with the 5,200 U.S. troops in the country is inevitable. Iraqi security forces in the al-Doulab area of Anbar province found and defused three Grad missiles that had been set on a timer to be launched at the al-Asad base in the province on Feb. 2. U.S. troops are stationed at the base, which President Trump visited in December. According to Iraqi media reports, the missiles were defused 15 minutes before they were set to launch. This followed September strikes by Shiite militias on the U.S. Embassy in Baghdad and the U.S. Consulate in Basra. Two days later Ja'afar Husseini, spokesman of Kataib Hezbollah, one of the most powerful of the Shiite militias, warned that clashes between the Iran-allied fighters and the U.S. "may start at any moment." He added, "There is no stable Iraq with the presence of the Americans." He echoed Qais al-Khazali, leader of the Asaib Ahl al-Haq militia, who made similar remarks Jan. 28. The dislodging of ISIS has prompted this Shiite aggression and threats. 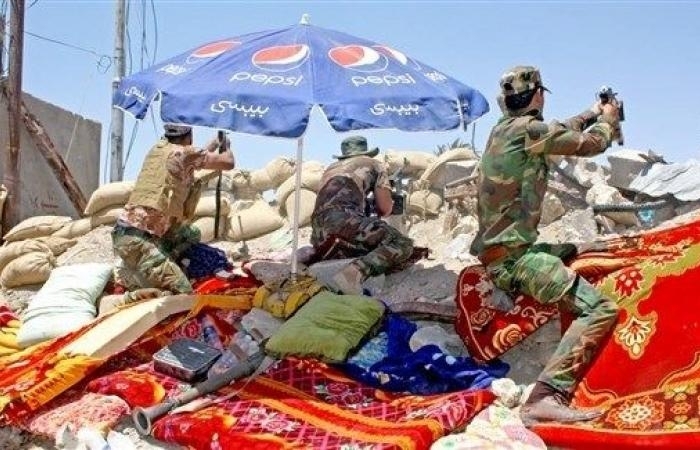 The Popular Mobilization Units were assembled mainly out of existing Shiite militias in the summer of 2014, as the ISIS juggernaut rolled toward Baghdad. That threat necessitated a truce between the Shiite militias and U.S. forces. Yet even at the height of the war with ISIS, the Iran-backed militias did not forget their enmity for the U.S. I embedded with Kataib Hezbollah during the fighting in Ramadi province in the summer of 2015. Fighters would regale Western journalists with stories a secret pact between the Sunni jihadis and the U.S. against the Shiites and Iran. The Iran-backed militias that now have U.S. soldiers in their sights are not merely military organizations. Their political wings compete in elections and are already making gains. The Fatah list of the Shiite militias, headed by Badr Organization commander Hadi al-Ameri, polled second in voting for Parliament last May. The rival Shiite list of Moqtada al-Sadr was the surprise winner. Iran's Qods Force commander, Qassem Suleimani, said in a rare public speech last month said that "today the best and closest friends of Iran are the rulers of Iraq." Two days later Rear Adm. Ali Shamkhani, secretary of Iran's Supreme National Security Council, said "the Iraqi government, Parliament and nation strongly oppose the presence of U.S. forces in that country," before predicting that "by the end of 2019, the United States will have to leave the rest of the region." Senior Iranian officials increasingly speak of Iraq as crucial to their regional strategy. It appears the militias and their Iranian patrons seek to turn the spotlight on the U.S. presence in Iraq as part of a larger strategy for building their own legitimacy. They will likely combine political and military action—deniable provocations on the ground to build an atmosphere of tension, along with a push for a parliamentary vote for the Iraqi government to request a U.S. departure. Killings of figures such as the novelist from Karbala will remind the population of who wields power on the streets. Renewed, if sporadic, attacks by Sunni jihadists also further the Iranian narrative. On March 6, they attacked a Popular Mobilization Units convoy near Makhmur, killing five militiamen. Such incidents help the militias portray themselves as the shield protecting Iraq's Shiite majority. If the Iranian strategy succeeds, Iraq's future might look like Lebanon, where the Shiite Hezbollah militia is an untouchable power inside the formal structures of the state and out. A Badr Corps officer told me at the movement's headquarters in Baghdad: "In Iran, you have the Artesh [army] and the IRGC"—the Iranian Revolutionary Guard Corps, a state-organized Islamist militia. "So it will be also in Iraq. There will be the army to defend the borders, and the Shia militias to defend the regime." It would be a mistake to underestimate the militias. Jonathan Spyer is director of the Middle East Center for Reporting and Analysis and a research fellow at the Jerusalem Institute for Strategy and Security and at the Middle East Forum. He is author of "Days of the Fall: A Reporter's Journey in the Syria and Iraq Wars."